Defence Minister Peter MacKay went way out on a limb in backing the costly F-35 fighter jet, and his political opponents are eager to cut it off. In many respects, Chris Hall reports, this fight is personal. 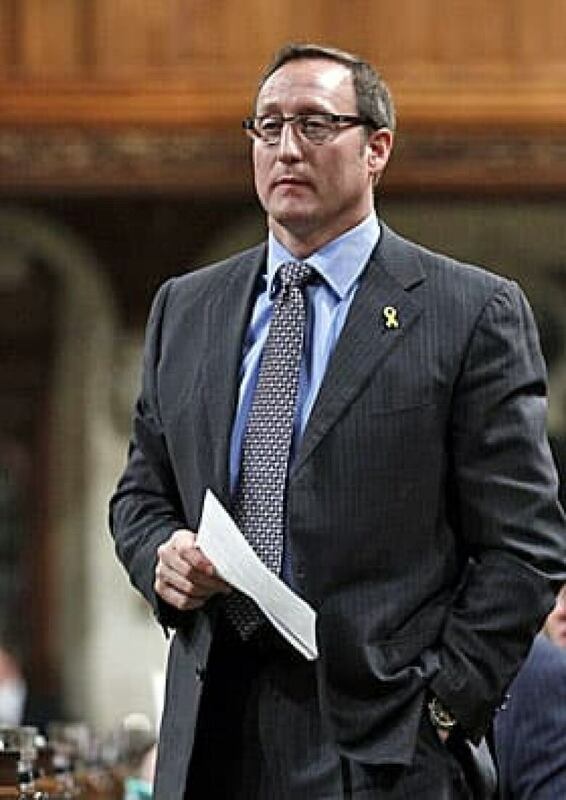 The House of Commons wrapped up its fall session this week, a few days earlier than planned but not a moment too soon for Defence Minister Peter MacKay. It's not clear why opposition politicians agreed they should all head home for the holidays on Wednesday. Especially when earlier in the day an independent audit confirmed what they had been arguing about for the past 18 months — that MacKay's $9-billion price tag for the controversial F-35 fighter jets represented only a fraction of the total cost to be borne by taxpayers in the decades to come. For the Harper Conservatives, the decision to adjourn this quickly has to be seen as something of an early Christmas gift. The government had received the KPMG audit and other reports on the controversial F-35 purchase weeks ago, and chose to make them public just before the break in a bid to minimize the political fallout. With no question period now until the end of January, and Canadians increasingly preoccupied with the festive season, the opposition passed up a rare opportunity for real accountability, and with it a chance to leave voters with an enduring image of a government that was prepared to play fast and loose with taxpayer dollars. The Conservatives have worked hard since 2006 to portray themselves as the party of sound fiscal management. This theme is on display at every turn: when announcing cuts to the public service, in extending eligibility for Old Age Security by two years, in moving to restrict access to employment insurance. Failing to meet their deficit elimination targets, not once but twice, was no deterrent. It simply reinforced the Conservatives' determination to work harder on the cost containment front. That's what made their long, increasingly improbable defence of the costly F-35 fighter jet so hard to fathom. Of all the fighter jets out there, only the F-35 got a look. Peter MacKay said it was the best plane, the only plane to meet Canada's needs. Critics of the government's low-ball cost estimates, by the parliamentary budget officer Kevin Page, even from Auditor General Michael Ferguson, were waved off. Until this week. Public Works Minister Rona Ambrose made a surprisingly candid admission when she appeared before reporters on Wednesday with a sombre MacKay, to explain that the government had actually hit the ''reset'' button in response to the auditor general's report in April. Intentional or not, Ambrose's comments were an indication that those necessary controls weren't in place when the F-35 was the sole-sourced choice of the military. The U.S.-built F-35 is far from the only plane out there. Even so, the government still isn't calling for new bids from other manufacturers, still isn't conceding that the F-35 — with all its cost overruns and mounting criticism from other countries involved in the consortium — won't still be chosen. Those decisions remain up in the air, so to speak. That leaves the government with the challenge to prove that the F-35 is not only the best plane for Canada's future but the one that comes at the best price. But that is not the only challenge. Opposition politicians have homed in on MacKay's role in supporting and defending the F-35. While he's already been stripped of responsibility for the F-35 file, his opponents say he's also lost credibility as minister, which means calls for his firing won't disappear. In many ways, it's personal. MacKay was especially strident in defending the F-35 as the only plane that fits Canada's needs. There are many MacKay quotations in media archives where he accuses opposition MP's of being uninformed, anti-military, even unpatriotic, for questioning the government's price tag. Interim Liberal Leader Bob Rae, for one, was not in a forgiving mood. On Wednesday, MacKay remained defiant — if subdued — as he spoke for the first time in weeks to defend those comments. He stuck stubbornly to the $9-billion price tag for the F-35 fleet of 65 planes, even now that the auditor general and others have long abandoned it in favour of describing the total costs of the program, and even when reporters asked him if he'd gone too far. It will be tough to convince Canadians of that line. It's like telling them that you can go ahead and budget for that new car without factoring in the cost of gas, insurance and repairs. That said, Prime Minister Stephen Harper isn't one to waver in the face of criticism. And, when it comes to the F-35 file, MacKay is only part of the problem the Conservatives now face. They promised voters they would respect their tax dollars, and Harper vowed to be more accountable and more transparent than previous governments. As an issue, their mishandling of the F-35 costs was a gift to the opposition before the holidays. But with six weeks until the Commons returns, the opposition better hope that it's a gift that keeps on giving. Is the F-35 really 'the only plane' after all?